mortimer common | Can Men Cook? Sometimes you just come across a pub by sheer luck. We tend to use the Good Pub Guide – which does take a lot of the hit and miss of taking a chance out of the equation. It is usually pretty accurate. But this week we found a lunch time place just by saying “this will have to do”. That’s how we came up with The Horse and Groom. Mortimer Common is a pretty village south of Reading. We were there to update our efforts with Old Bull and Bush – the treatment for our TV prog is out for consideration at the moment. (see web site – www.oldbullandbush.co.uk ) Jay and I always had a rule when we set the company up – all meetings had to be in pubs! That is our only rule in the business. Bet you wish that was your Mission Statement!! 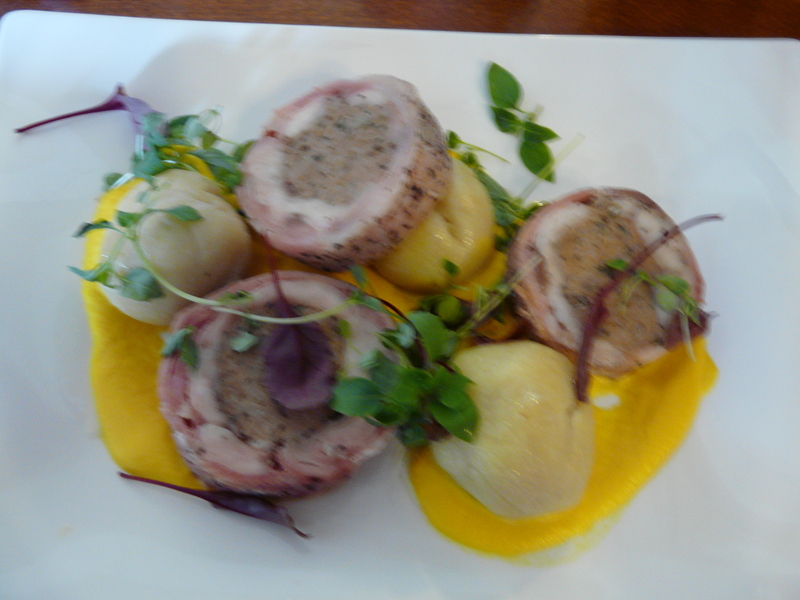 The specials included Rabbit Ballotine with dumplings. The dumplings were the European variety – incredibly filling, and a surprise because they look like mashed spud! Craig and Marcelle run both this pub and The Red Lion close by. They also have an Michelin level place called The Eagle at Little Coxwell. That level of food know how shone through in this dish. Jay and I were really very quiet during lunch. It was quite splendid. What was even more impressive was the level of service at this place. Attentive, attention to detail and a real love of people and food – all of this adds to the experience. Well worth seeking out.